I think our marriage has a pretty typical division of domestic labor: my husband is generally in charge of purchasing the automotive needs of the family, my job is to drive the kids around thousands of miles while crushing Goldfish crackers all over the back seat. It works for us. Because I’m helpful, I’ve compiled some tips on my purchasing experience, so you’ll know what not to do if you’re ever in the market for a motorhome of your own. 1.) You have never known the depths of inadequacy until you’ve tried to retract an RV awning. Factor in the cost of extensive psychotherapy into the sales price. 2.) Be mindful when test-driving that Cousin Eddie jokes fall flat, Thelma and Louise jokes: flatter. 3.) The person who designed all Courtyard motel rooms from 1983-89 went on to decorate every motorhome since. I assume. 4.) Your salesman doesn’t know what Pinterest is. Or email. Or the Internet. The office manager is a guy named Gutenberg who still deals in carbon tissue paper and rotary phones. 5.) 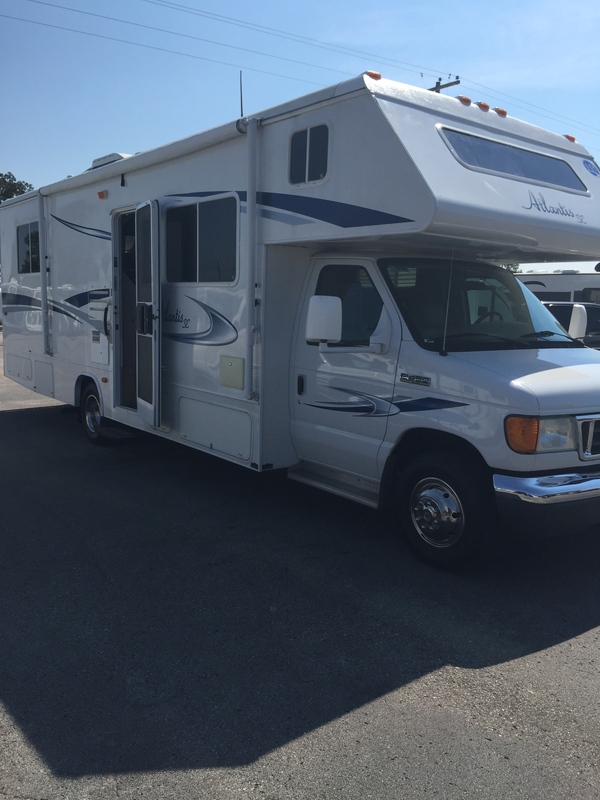 You don’t need a special drivers license to drive a Class C motor home. Not even if you beg and plead because your original photo from the DMV looks like a tragic Frida Kahlo self portrait. 6.) When they say that a unit sleeps 8, make sure they are referring to humans and not hobbits. 7.) Patient Zero convalesces on a used RV mattress. Replace accordingly. 8.) An RV can get 18-22 miles per gallon. Oh wait. Check that. They use 20 gallons to run the coffee maker and dome light at the same time. 9.) When the dealer refers to “blackwater” and “greywater” tanks, it has nothing to do with fall fashion trends. 10.) Speaking of backwater, typical division of domestic duties should resume the moment this needs emptying. 11.) It takes a lot more Goldfish to decorate a 31 foot motorhome.